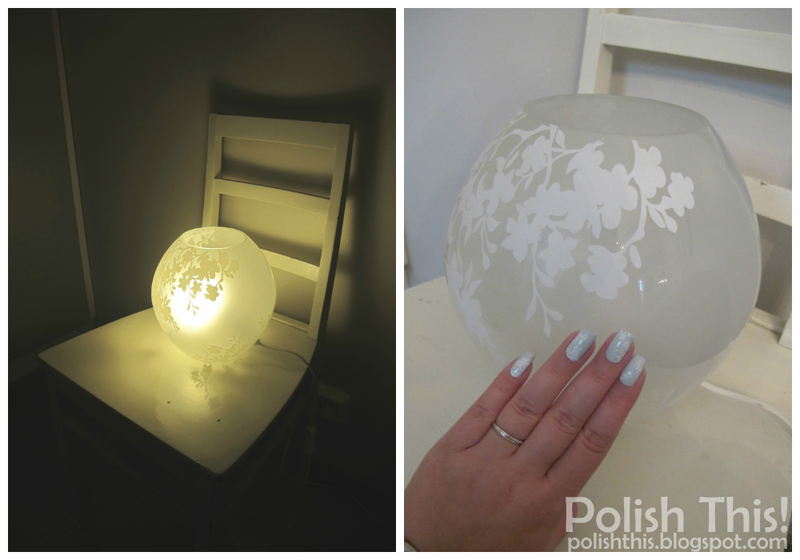 #ablecaw14 Week 2: Peculiar Inspiration - Polish This! Another week, another challenge manicure. I'm really excited about this challenge and the fact that many of you decided to join in, that's really awesome! There's of course always room for more people, so if you want to, you all are still welcome to join in too. You can jump in from which ever week you feel like suits you the best or maybe you like to do those previous manicures too and catch up doing more than two manicures per week. For more info about the whole challenge check out my first post about it. Did you notice?!? I have at least somewhat succesfully stamped!!!! Yep, I know it's not a big deal for most of people, but I always struggle with it, so I'm very very proud about these nails! I'm well awere that my stamping here isn't no where near perfect, but I'm still very happy with it. Because of my inspiration I wanted to stamp the floral pattern on different places on each nail and more on some than others, so this of course meant that I didn't have to focus my stamping similarly on each nail and that made this whole thing way easier for me. I'm a bit of perfectionist for some reason when it comes to stamping and that's why I always feel like I can't get it right because the patterns aren't exactly at the same place on each nail. But like I said, this time there wasn't need for that, so even I managed to stamp! I started this manicure with two coats of Color Club Silver Lake, then I did the stamping with Konad White and the pattern is from MoYou London Pro Collection XL Plate 06*. I also wanted to add some sparkle, once again because of my inspiration for this manicure, and I decided to add just a little bit of KBShimmer I Only Have Ice For You randomly on each nail. Then finally I matted the whole manicure with BK Super Matte Surface Oil*. It's a very very cheap lamp (it's called KNUBBIG if someone is interested) but I quite like it. Of course my flower pattern isn't really similar to that in the lamp, but I just took inspiration, I wasn't trying to make my nails look just like it. I really like this manicure, it's soft and sweet and I think it looks really good matte! Also more importantly, I managed to do some stamping nail art, yay! How do you guys like my Peculiar Inspiration nails? *Disclosure: I have gotten Sally Hansen Nail Rehab and MoYou Stamping Plate from a goodie bag of our meet. I also have gotten BK Super Matte Surface Oil originally for review. For more information view my disclosure policy. And good for you, ha, that you managed some stamping you feel great about. And just btw, I think this sort of "mismatched" stamping is even better than the usual style, trying to get all the nails the same.